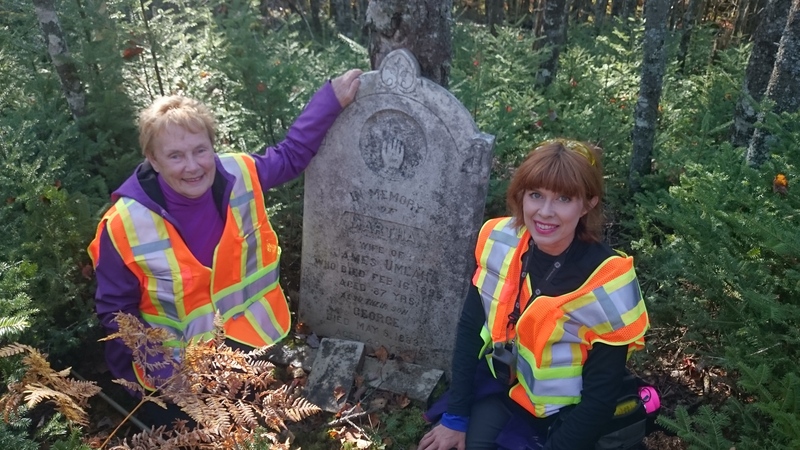 On a recent sunny afternoon, three avid hikers; Krista Whitehouse, Beth McGee and Steve Copp, trekked for several kilometers through rough wilderness trails to visit three long-abandoned cemeteries that still pique the interest of hikers in the area. 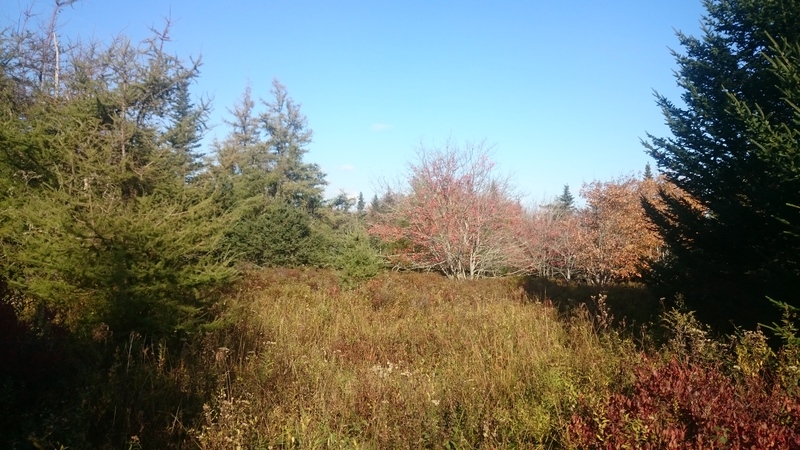 Located south of HWY 103 and the HRM Otter Lake Landfill facility, the cemetery locations are described in the A Walking Guide to the Old St. Margaret’s Bay Road second edition. 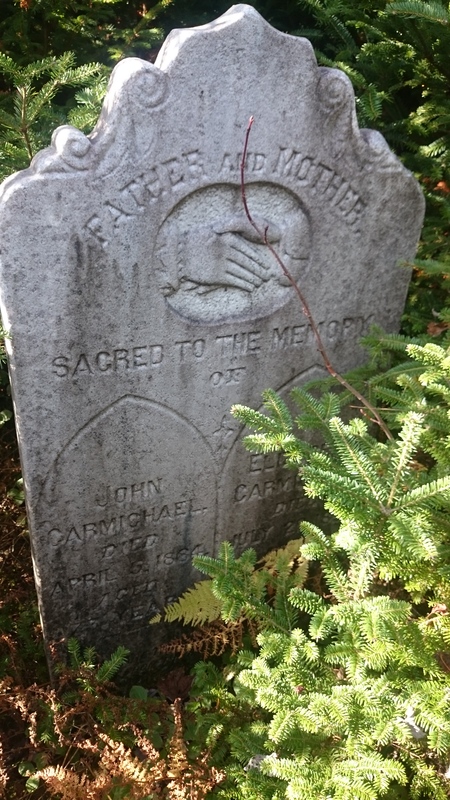 The Otter Lake Cemetery (Point 16), the Carmichael Cemetery (Point 12) and the Greenhead Road Cemetery (Point 15) are noted as Points of Interest. The group travelled by truck on the Greenhead Road, before continuing on foot to track Latitude and Longitude points for each Cemetery location. By sharing these this way, hikers have exact GPS coordinates to the actual headstones. The Otter Lake Cemetery is located on a section of the original Greenhead Road, which is now inaccessible. The group went over rocks blocking the entrance and then walked for about five minutes down the Road until the Otter Lake Cemetery sign was visible. The group turned into the woods before reaching the sign and then scrambled over hurricane damaged, downed trees to reach the Cemetery. Once they reached the tombstones of Martha Umlah and her son George, the walking was described as “a little easier”. On the way back to the Greenhead Road, the group again saw the Otter Lake Cemetery sign. “That is by far the easier way to reach the resting place of Martha Umlah and her son George,” says Beth. Next up, was the Carmichael Cemetery, which comprises two visible headstones. With Steve Copp’s direction, the group walked along the side of a burrow pit to reach the barricaded Greenhead Road and walked in a southerly direction until the Carmichael Cemetery sign was visible on the south side of a large tree. This directional sign is a useful marker; however, the group still had to bushwhack through dense foliage to reach the actual cemetery site. To help others find it, pink flagging tape was tied on trees nearby to mark the tombstone area. The burrow pit the group walked around to reach the Greenhead Road. The third location visited was the Greenhead Road Cemetery, which can be accessed from the Greenhead Road via a well travelled trail on the east side of the Road or by walking on the north side of a former borrow pit. There is a lovely field as described in the Guide. As you face east, the trail to the Cemetery is in the lower left (Northeast) corner of the field. By following what remains of an old road downhill, you will come to a drumlin on your right and some of the headstones will be visible. Sadly, this Cemetery is getting quite overgrown. Page 33 of the Guide gives the descriptions of the headstones to be found there. The field where hikers will find a rough path to the Greenhead Road Cemetery. 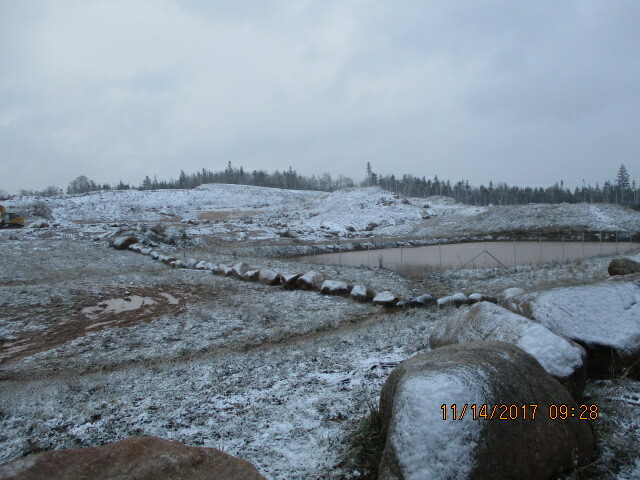 Thanks to Steve Copp, Manager of the Otter Lake Landfill, Krista Whitehouse of the Halifax Outdoor Adventurers and the Association of Nova Scotia Geocaching, and Beth McGee, Five Bridges Wilderness Heritage Trust Advisor for confirming these important coordinates. Photo credits to Steve Copp and Krista Whitehouse from the adventure.